Air Conditioners and Frozen Balls - Nekaro & Co. I have returned!! Against my better judgement too. Our weekend trip to the beach was not long enough. I didn't take nearly enough photos. I was scared to take the big camera to the beach for fear the sand would eat it. 'Cause there was sand in everything. What the hell am I saying... there is STILL sand in everything! So many of my photos were taken with my little Canon instead. It was hot. It was humid. 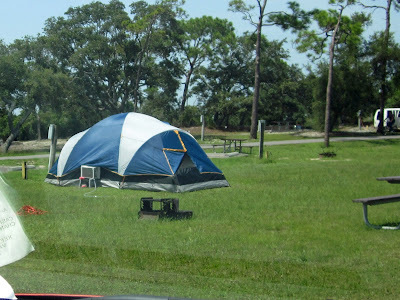 The campground was... meh. The other campers were... meh. For the first time in my entire 33 years of life, I saw the strangest thing ever. Air conditioners in tents. No, I'm not kidding. Kaia: Look at that truck! 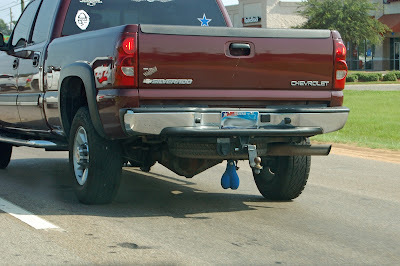 It's got balls! Me: Oh jeez... I've gotta get a picture of those. Me: ... ... uh, yeah. That's what that means. On the way down, we ran into some backed up traffic a little south of Birmingham so we decided to exit the interstate, grab some gas and grub. Only after making the exit did we see that local police were blocking the entrance ramp back onto I-65S. We spent the next hour and a half driving 40 miles on a two-lane road going between 15-25 miles an hour before FINALLY getting to another on-ramp. On the way home, we decided we were all getting hungry and it wouldn't hurt to just top off the gas tank so we exited at the next available one. As soon as we came to the stop light at the end of the exit ramp we realized... WE WERE AT THE SAME EXIT! We'd paid no attention to the exit number the previous stop and had no idea we were stopping at the same one. Tomorrow I'll probably share more interesting photos. Like ones of beaches and cannons!